The Iraqi Media House in its 37th report monitor the media coverage of the formation of the new Iraqi government and the selection of the three presidencies and the outbreak of a war of leaks between the local media turned out to be incorrect, and how the use of television channels and news agencies with intent or otherwise in the spread of fabricated news,Which split the public opinion on the other hand. The report examines the number and quality of news coverage to cover the political developments that followed the country's general legislative elections in May 2018 and the subsequent selection of presidents and parliament and the appointment of Adel Abdul Mahdi to the task of forming the new government. The report includes monitoring of more than 30 media outlets, ranging from television channels, agencies and news websites. The report focuses on counting the content and types of the content, how it is handled, and then analyzing and comparing it to the overall media content. The report notes that the media coverage of the local media since the end of the general elections dozens of fabricated news and a media leaks war exchanged by various media platforms away from the standards of professional media, through news not based on sources and explicit information on the attack on parties and politicians or defense. All these effected on the public opinion, which is looking to understand what is happening in the political scene in the country. And dealt with the war leaks and news information about secret deals between blocks and countries, and candidates for senior positions in the country, and scenarios for the formation of the government and the selection of the three presidencies, while it was noted that the war leaks were circulated on social networking sites and used by the media as a major source without confirmation of authenticity. 1- Media involved in a war of leaks whose parties were political forces that sought to use media platforms to pass information and false news that influenced the political process to form a government and choose senior positions in the country on the one hand, and contributed to the delivery a false information to public opinion. 2- The media ignored the professional standards in the coverage of the news through the adoption of dozens of important information based on sources refused to be named. As well as statements to politicians and deputies attacking their opponents and later found that it was wrong and incorrect, while the media and journalists did not make an effort to verify the news validity and take the other opinion to achieve a balance in media coverage. 3- Media outlets used social media sources for many of the news and leaks concerning the formation of the government and the choices of the three presidencies published by the pages funded on Facebook and turned out to be wrong, while the media ignored the caution of dealing with social networking sites which are not a reliable source of news, These included information on the names of the new cabinet reshuffle and behind-the-scenes deals for the election of the heads of the republic, the parliament and the government, and images of meetings between political figures and clerics which appear to be old. 4- The war of media leaks and fabricated news in violation of political negotiations through the submission of news and reports on the nomination of specific names for specific positions and other exclusion, and contributed to these campaigns to create debates at the political and popular level which contain speech of hatred and insulting on social networking sites. 5- Media used to publish media coverage on the formation of the government in the views of politicians and deputies without information, while the media adopted some of these views to launch conclusions on negotiations between the blocks and political parties later turned out to be wrong. 6- The neglect of focused media coverage, which deals with the details and challenges of the political scene and the legal and constitutional backgrounds of political work and the use of politicians and analysts in their non-competence to explain the political dynamic make the coverage far from the political reality. 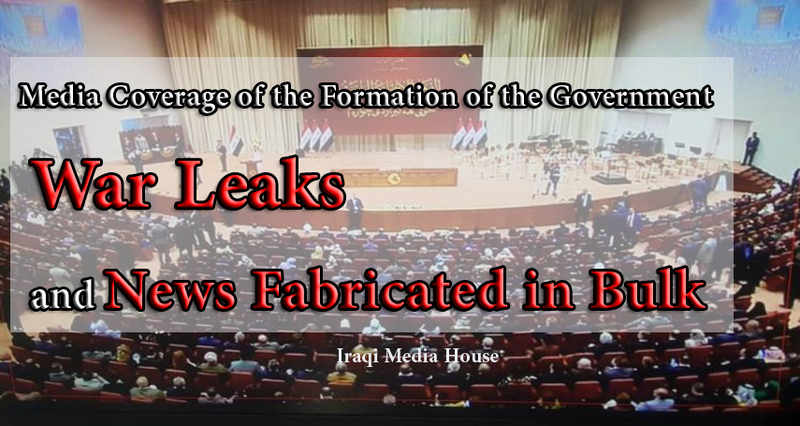 7- Media used only the use of data and public statements of the political forces without any effort to reach the information and details of the stages of forming the government, while the use of other media coverage of the Arab and foreign press to publish in their positions. 1- The media have to give important events in the country, such as the process of forming the government media coverage of professional based on clear information to the public and do not get involved in being used for the purposes of political dichotomy and broadcast conflicting news by political and non - political and thus reflected negatively on the public opinion and how it interacted with Political events. 2- Journalists and media professionals should seek information rather than opinions in the discussion of important political issues, taking into account the importance of verifying the sources of information and their compatibility with more than one source to get a media coverage of information and useful backgrounds for the public opinion. 3- The media must deal with the news published on social networking sites with caution and not rely on reliable sources of news that come through funded pages that claim to belong to the political parties and be careful not to fall into the trap of electronic armies that launch organized campaigns for their own purposes. 4- The main task of journalists in covering important events is to obtain reliable information and present it to the public, not through political opinions and positions. The media should not adopt the individual statements of politicians as a position representing the political body they represent. The information contained in these statements is not often a sufficient source of approval before boycotting them with more than one source.